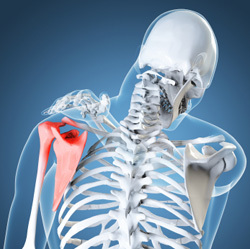 Most often, shoulder pain can be traced to tenderness or soreness of the rotator-cuff tendon. The rotator cuff is the part of the shoulder that allows you to move your arms in a circular motion. In other cases, the bursa, or fluid sack, in your upper shoulder can become inflamed after a period of heavy lifting or other kind of physical activity involving repeated raising and lowering of the arms.